The Ultimate NHL Road Trip is back! These tickets are only available in Atlantic Canada. 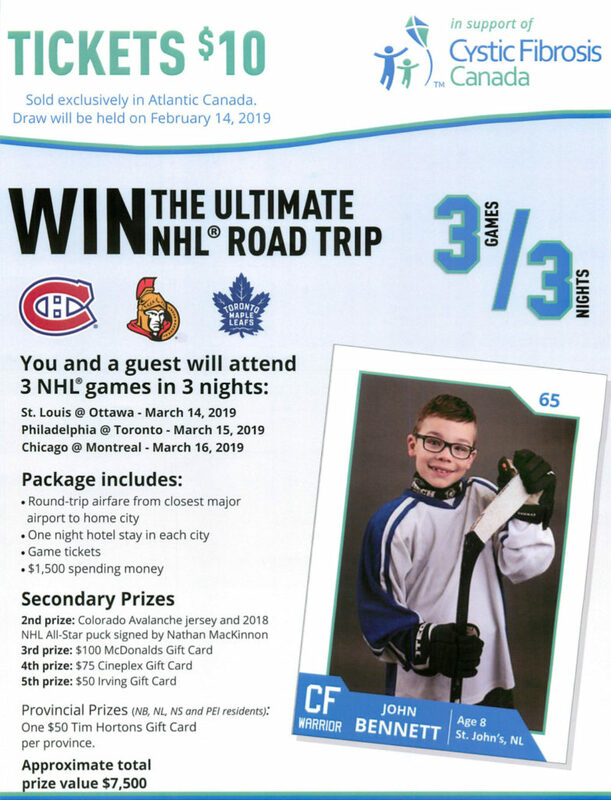 The grand prize winner will see three NHL games in three nights, along with airfare and some spending money. It’s a great stocking stuffer and a great cause, in support of Cystic Fibrosis Canada! All members of the Bible Hill Kinsmen have tickets to sell. They’re also available at Century Hyundai (Ask for John or Quinn), and at the customer service desk at Sobeys on Robie Street. Our members will also be at the Rath Eastlink Community Centre during the Truro Bearcats/Pictou County Weeks Crushers game on November 3rd selling tickets. You can also contact president@biblehillkinsmen.ca.